Was it just us, or was Fat Bear Week one for the ages this year? A huge congratulations goes out to our dear friend, Beadnose, for her hard fought victory over the formidable Bear 747 (John). We spent most of our summer with these bears at Katmai National Park, and it's beautiful to see how fat they got after we left. Next year we'll be sure to set up a contest where we can all participate in the festivities. Osa, Osito and I would like to thank you all from the bottom of our bear hearts for the outpouring of support after our announcement last month. We agonized over the decision to conclude our dinners at the end of the year, but it fills us up with joy to know we'll be seeing many of you one more time. It's been a bittersweet last couple weeks, but your kind words mean the world to us and have kept us going. Thank you! Dinner seats are filling up fast, but there is still some availability before we move on to our next adventure. We also have a handful of dates open for private holiday parties in San Diego and Seattle. Additionally, we've had a couple inquiries about private parties in January of next year and we'd love to accommodate these if possible. If you're interested in a January dinner, please reach out directly atbear@cowbybear.com and we'll do our best to make it work! We're just 9 days away from the release of our limited edition beer with Ballast Point, Beer by Bear! The beer will debut at our collabearation dinner at Ballast Point Miramar on October 20. There are two tickets still available for this dinner, so if you act fast you can still get in. Just email miramarevents@ballastpoint.com to inquire. We hope to see you there! 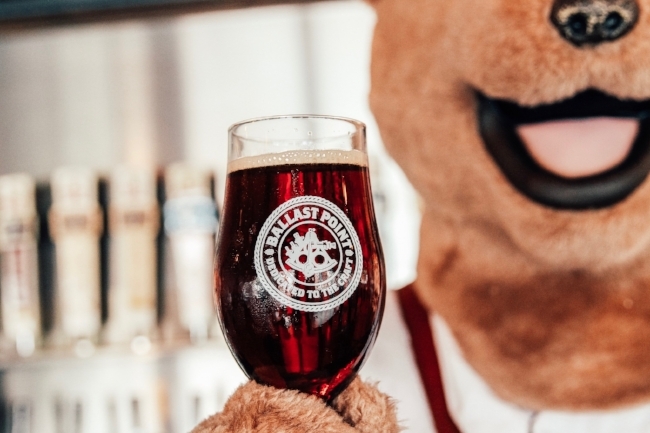 Beer by Bear will be on tap for a limited time at all Ballast Point breweries beginning October 21! This is a dish we cooked for our bear friends in Alaska as an alternative for their beloved salmon. They went wild for it and we think you will too. Currently on the menu in Seattle! You'll want to give yourself two days for this recipe, as the fish should be cured and tomato water should drip overnight. Special equipment needed: vacuum seal bags and sealer (or ziplock bags), fine mesh strainer and cheese cloth. 1. Make sure the filet is dry and deboned fully. Season all sides very liberally with salt and sugar, then set on a cooling rack on a sheet tray and refrigerate, uncovered, for at least two hours. 2. Pat dry and place in either a vacuum bag or ziplock bag with enough olive oil to fully submerge the fish. If you have a vacuum sealer, just seal it up and let it cure overnight. If you're using a ziplock bag, try to force as much air out of the bag using the water displacement method by slowly submerging the bag in water, then close it, wrap it in cling film and let cure overnight. 1. Line a fine mesh strainer with cheese cloth and place the strainer in a container to collect the tomato water. 2. Pulse your heirloom tomatoes a couple times in a food processor until slightly watery, but not pureed. Pour into the strainer very gently. Don't push the tomato pulp through or go too fast, or it will make the water cloudy. Let drip overnight. 3. The next day you will have a couple cups of very clear and very delicious tomato water! 4. Season with the mezcal first, just enough to get a hint of smoke. A little goes a long way. Then season with salt to taste, and if you want a hint of sweet sugar or simple syrup. 1. Put all ingredients except the olive oil into the bowl of a food processor and turn on the processor. 2. Very slowly drizzle in the olive oil to make an emulsion. Season with salt to taste. 1. Remove the fish from oil and wipe off as much as possible. Dice the fish into medium sized shingles, about 1 inch by 1 inch. Combine in a mixing bowl with the supremes, lemon juice and some salt. Mix well. 2. Divide the mix evenly in four bowls, keeping the mix in a tight nest or a straight line. Spoon the tomato water into the bowl, just enough to come a quarter of the way to the fish. 3. 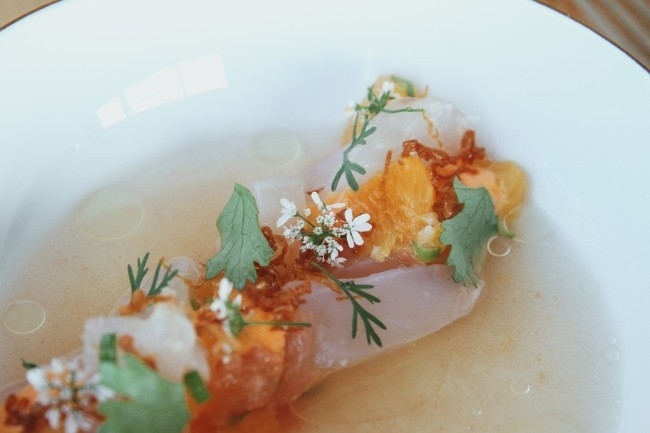 Garnish the fish with little dabs of the aioli, whole cilantro leaves, and crispy shallots. This one's a take on my late Papa Bear's favorite cocktail, the Gibson. I recently procured somecelery bitters and knew exactly what I'd do. 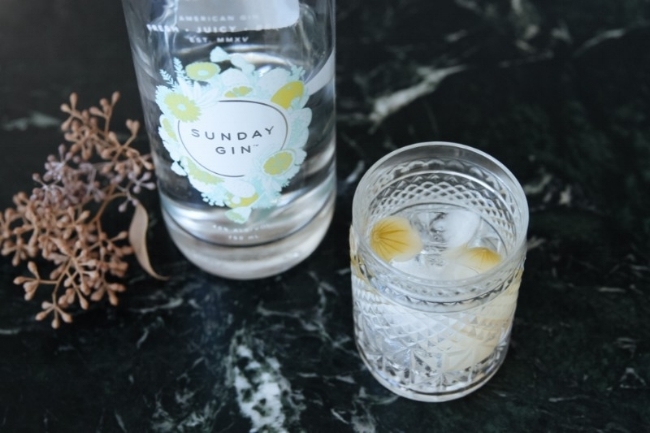 Our favorite gin these days is the Sunday Gin from the team over at You & Yours in East Village. They're the first woman owned distiller in San Diego and highly recommended! 1. Combine one ounce of gin, six celery bitters and a splash of dry vermouth into a high-ball glass. 2. Give it a good stir. 3. Add one large ice cube and as many cocktail onions you'd like (I suggest 20 but most people are happy with 2 or 3). 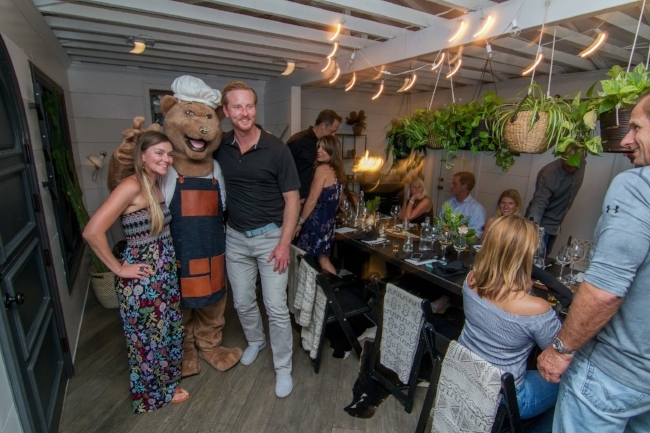 Sign up to receive the 'Bear's Necessities' newsletter for recipes, news and priority updates.